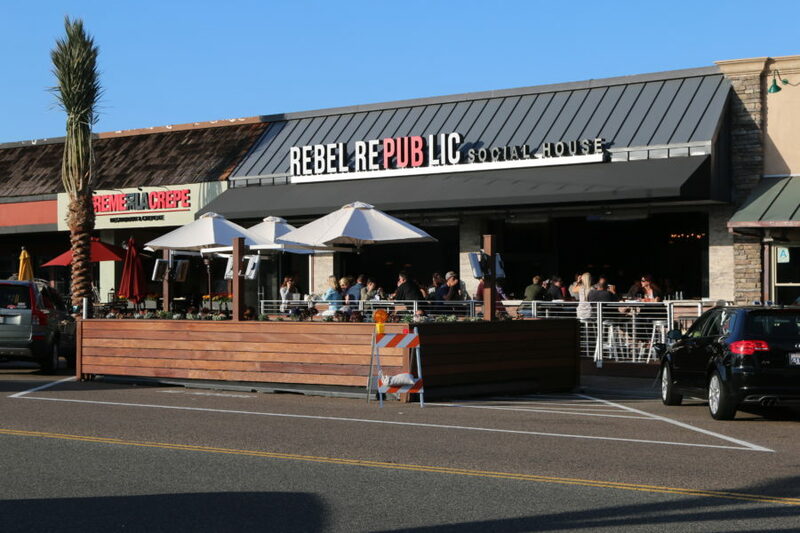 Located in the heart of Riviera Village, Rebel Republic Social House launched with a soft opening on April 23, seeking to bring in the 21- to 25-year-old crowd often found in the bars and restaurants of nearby Hermosa Beach. But the Village’s newest restaurant might signal an even greater change to the popular South Redondo shopping district. Rebel Republic’s draw is an outdoor dining deck, the first in a City of Redondo Beach-initiated pilot program. The program aims to create a more aesthetically-pleasing, outdoor-friendly Catalina Avenue corridor, and the location was one of two sites considered for dining decks; a second location was identified for the space in front of Redondo Beach Brewing Company and Zazou. However, only Rebel Republic applied to the program. The deck is already paying dividends for the restaurant, which is still at least a week away from its grand opening. “If the weather’s nice, [the deck’s] the place to be,” said Rebel Republic manager operating partner Andrew North. It has had detractors, most prominently on the neighborhood-based social media network Nextdoor. Users have complained about both about aesthetics and the loss of three parking spaces caused by the installation of the deck. “If the other restaurants follow suit, wouldn’t we be eliminating precious parking, ultimately forcing cars into the nearby residential neighborhoods?” a Nextdoor post asked. As it stands, Rebel Republic owner Paul Hennessey has offered three spaces behind his HT Grill restaurant as a replacement for the spaces lost. That item is still in early review stages, and isn’t due to be discussed by council until September, City Manager Joe Hoefgen confirmed. But expanded outdoor dining options could only happen if the pilot program passes muster — which, according to Ginsburg, relies on finding dining decks to be more beneficial to the area than not. “If there was crazy partying and police calls going on out there, I think that would be an unsuccessful program,” Ginsburg said. “But the times I’ve walked by there, I haven’t seen anyone acting out of hand — and I actually think it’s calmer than Mickey Finnz,” the restaurant concept replaced by Rebel Republic. As for neighboring businesses, the consensus regarding the dining decks appears to be somewhere between jealousy and excitement. Ginsburg says that restaurants up and down the Village are interested in building decks of their own. Retail businesses are excited as well.